Many unwanted behaviors stem from pets seeking their owner’s attention. 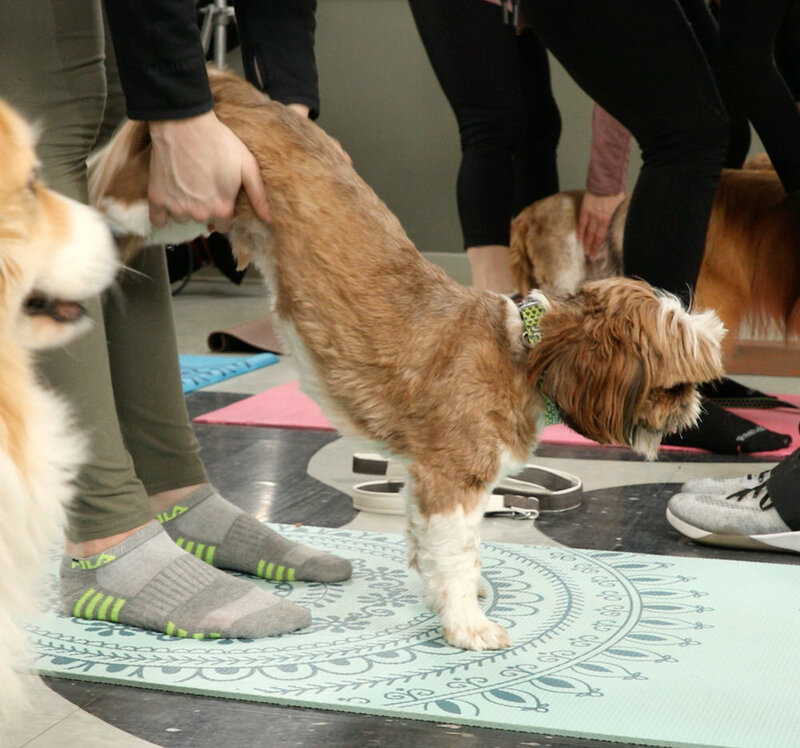 Younger dogs in a dog yoga class have a great opportunity to socialize with other dogs and other people. Also, this is a gentle way for younger dogs to get used to being handled by their owners. This is beneficial when you need to clip their nails or brush their fur or clean their ears etc. We also have found that holding a fun and social class like dog yoga at the vet office gives pets the message that the vet is a good place to go (not just a place to get shots). Our dogs and cats aren't good at letting us know that they are hurting or not feeling right. Yoga may help you discover that your pet has some painful joints or muscles, which is something you can discuss with your veterinarian. It's also a great activity to engage your pets mentally. It’s good for your pet’s brain to learn something new in a fun and gentle way. Doing yoga with your pet is just one of MANY fun and creative ways to spend time together and develop your relationship. Companion animals reduce stress and keep us motivated to exercise regularly which has a positive effect on our health and mental well-being. They are also wonderful at teaching us how to unplug from technology and be presen. Dog yoga is a great opportunity to meet like-minded folks and become part of an animal loving community. Check out some of our live events and experience it for yourself!